The boxart for Super Mario Bros. Deluxe. 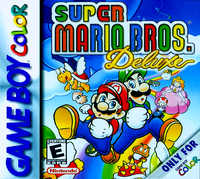 Super Mario Bros. Deluxe is a video game released for the Game Boy Color in 1999. It is a remake of Super Mario Bros. and Super Mario Bros.: The Lost Levels. In Japan, the game was released for the Nintendo Power cartridge rather than for the Game Boy Color. "Bowser has once again taken over the Mushroom Kingdom, and it's up to Mario to put and end to his sinister reign. Battle Bowsers evil henchmen through 32 different levels - all taken directly from the 1985 classic! Then move on to collect special Red Coins and Yoshi Eggs in Challenge Mode. Or face off against a friend and race through 8 competition courses in the all new VS. Mode! This time there's a lot more to do than just save a Princess, so get ready for a brick-smashin', pipe-warpin', turtle-stompin' good time!" The story of the game is the same as the originals, as most other aspects of the game. There are several modes such as: Original 1985 (Super Mario Bros.), Challenge, Super Mario Bros. for Super Players (Super Mario Bros.: The Lost Levels), Versus Mode and Toybox. This page was last edited on 20 January 2016, at 20:46.